An eclectic blend of cultures and traditions, the Mother City is a modern and cosmopolitan city located at the southern tip of Africa. Sitting in the shade of the iconic Table Mountain, it is among the world's most beautiful cities. Cape Town's many attractions include its postcard-perfect beaches, tucked away between fashionable cafés and multimillion-dollar beach houses as well as excellent restaurants and a lively nightlife that attracts many Hollywood celebrities. The rolling hills of the nearby Cape Winelands offer decadent tasting experience while climbing at least one of the spectacular mountains in the city is a must. In addition to the most famous tourist attractions, visitors can enjoy a traditional South African braai or shisa nyama (barbecue) at lively township restaurants like Mzoli's, catch a rugby match at the historic Newlands Stadium, go on a pub crawl down Long Street, or browse the wares at one of the city's delightful craft and food markets. Cape Town is a melting pot of cultures, with African influences blending with Cape Malay, British and Dutch culture. Mix in a blend of residents and tourists from all over the world, and you have a fascinating city that never fails to enchant. December to February (summer) is peak season for Cape Town, although the weather can be lovely in spring and autumn with crisp, clear days ideal for sunbathing and sightseeing. The December holiday season can be uncomfortably hot at times and tends to be crowded with local tourists. Winters in Cape Town can be cold and rainy and are usually avoided by travellers. Read more on Cape Town's Climate and Weather. -Visit the District Six Museum for a peek into Cape Town's tumultuous history. -Tour the infamous Robben Island prison, where Nelson Mandela was held for nearly 30 years. -Say hello to the marine life at the Two Oceans Aquarium. -Take a township tour through Gugulethu or Khayelitsha. -Take a cable car to the top of the iconic Table Mountain for a spectacular view of the city. -Sun yourself on the sand and cavort with penguins at Boulders Beach. -Treat the kids to a ride on the rollercoasters at Ratanga Junction. -Have a picnic and listen to a concert in the stunning Kirstenbosch Botanical Gardens. 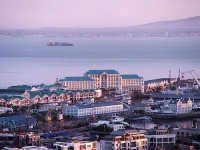 Cape Town is well-situated to be part of a larger holiday in South Africa. Tourists can take a trip through the Cape Winelands, drive along the Garden Route, explore the beaches on South Africa's West Coast, or fly up to Johannesburg for a safari in Kruger National Park. Popular weekend getaways include wine-tasting in Stellenbosch, whale-watching in Hermanus, bird-watching in Knysna and shark cage-diving in Gansbaai. Cape Town International Airport is located 13 miles (20km) east of Cape Town, and there are buses and taxis available into the city. Flights to Cape Town are available from a number of major international airports, including Amsterdam, London, Frankfurt, Munich, Zurich, and Dubai. Many airlines offer flights with layovers in Johannesburg. However, travellers should make sure they have plenty of time to clear customs. Get more information on Cape Town International Airport. -Cape Town's two nicknames, the 'Cape of Storms' and the 'Cape of Good Hope', were given to it by Bartolomeu Dias, who 'discovered' it in 1486. -Every day except Sunday, the Noon Day Gun booms across the city to signal 12pm. The cannon is located on Signal Hill, and tourists can attend the ceremony. -The world's first heart transplant was performed by Dr Christiaan Barnard at Cape Town's Groote Schuur Hospital in 1967.